Eden Hazard scored once and assisted another goal in a 3-0 pre-World Cup friendly win over Egypt that gave worried Belgium fans hope of a promising World Cup campaign. Drawn in Group G containing England, Tunisia and tournament debutants Panama, Belgium are expected to cruise into the second round of the June 14-July 15 showpiece. However embattled coach Roberto Martinez has yet to win over fans, and is sweating over the fitness of key defenders Thomas Vermaelen (thigh) and Vincent Kompany (groin), both injured. Chelsea star Hazard, who survived a kick to his knee in the opening minute, forcing him off at half-time, said it was a performance Belgium would have to repeat in Russia if they want to progress. “I came off at half-time because I took a knock to my knee, but there’s nothing to worry about, it will be better tomorrow,” he said. “It was nice to add some rhythm to the match, to create some movement and score as well. Facing an Egypt side shorn of Liverpool star Mohamed Salah, recovering from a shoulder injury suffered in a 3-1 Champions League final defeat to Real Madrid, Belgium were given a chance to patch over some recent difficulties during their preparation period. Belgium struggled to a scoreless draw last week against a Portugal side missing striker Cristiano Ronaldo and Martinez, who has sidelined Roma star Radja Nainggolan, has faced plenty of criticism in the Belgian media. Missing Salah, Europe’s Golden Boot winner last season, Egypt’s goalscoring chances were automatically decimated. But even a characteristically strong defensive display by the Pharaohs wasn’t enough to contain Hazard, who played only the opening half, and the visitors at times appeared well below par. A superb ball from the Chelsea midfield star found Romelu Lukaku in space on 27 minutes and the Manchester United striker promptly scored his 34th goal for the national side. 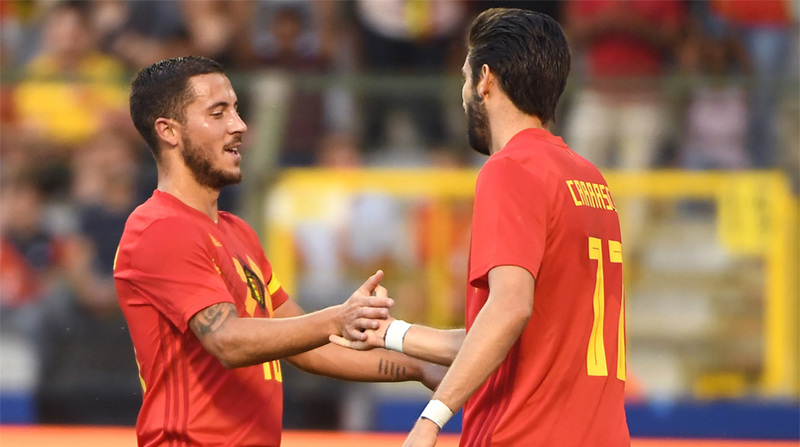 Seven minutes before the interval Yannick Carrasco turned provider for Hazard to hit his 22nd goal for Belgium in 80 appearances. In the final seconds another Premier League player, Manchester United forward Marouane Fellaini, hit Belgium’s third to cap what was a far more encouraging performance from Belgium.